I now have a 120 subscribers to my Stampin Inspirations and Card Inspired blog sites. Wow, I'm honored. When I started my blog sites, I didn't think that anyone would even read them. Really!! I created them mainly because I thought it would be fun to create a blog. I started initially with my "Reflections and Perspective" blog site just for fun. I wanted to post my thoughts on various subject areas. I decided to create a blog for rubber stamping because well, I love rubber stamping so why not. It was just something to do but it has grown into something that I really enjoy doing. It motivates me to create things and I have so much fun doing it. When I first created my blog sites, I was unaware of the amount of other rubber stamping blogs out there. I'm shocked that there are so many. I'm lucky to even have the amount of readers that I do have because there are so many talented stampers out there who have great blog sites. . .who am I? Just another stamper blogging my work. I would like to thank everyone who visits and/or who subscribes to my blog sites. 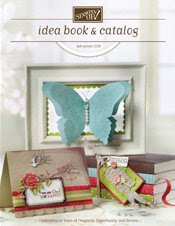 This blog candy are for those who are subscribers of either my Stampin' Inspirations and/or Card Inspired blog sites. If you want to participate in the blog candy and is not yet a subscriber, all you need to do is subscribe. To subscribe all you need to do is sign up at the top right of my blog's sidebar, add your email address and feedbitz will email you to let you know that you need to confirm your subscription. Annoymous subcribers will not be included in the drawing because there is no way for me to know who you are and how to contact you so when subcribing don't subcribe as "annoymous". I will add extra candies for those who subscribed to both blog sites. 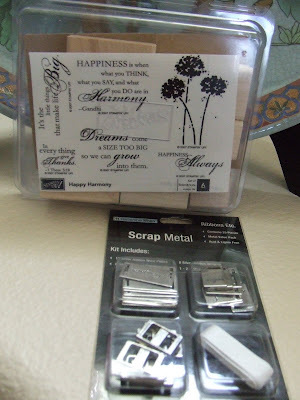 For those subcribed to only one of them, you will receive the Stampin Up "Happy Harmony" stamp set and the JoAnn essential metal embellishments. I will announce the winner on Friday, March 16th. . .this is one week from today. If you have a blog site yourself, I would appreciate you let your readers know about my blog candy or if you know of someone who loves to rubber stamp, please forward my blog site address so that they may participate as well. If you already have the "Happy Harmony" set and want to substitute it for another Stampin' Up sell-a-bration set, just let me know which one you want. Again, I would like to thank you all for being very kind with your comments and making my blogging experience a very fulfilling one! Feedbitz has your email address on file so I will be informing the winner via email! I will not be posting the winner's email address on my blog. Announcement of the winner on my blog sites will only be just to inform that I had sent an email to the winner. Wow! Cool blog candy! Thanks! You do great work and your blogs are fun to read. That's why you have so many subscribers. 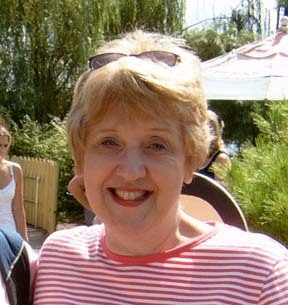 With or without blog candy, Maria, your blog is SO worth subscribing to. I happened upon it somewhat by accident and am so glad that I did. I can spend hours, between your two blogs, and still not have taken everything in. Sincerely, thank you for sharing your creativity and knowledge with the rest of us. i just found your site while looking for ways to use punches. You have an amazing blog with great ideas. I would love to win your candy offering, especially because I really want that stamp set. But either way, you will be read every morning. That's my morning constitutional...reading and being inspired by creative stampers. I have been a subscriber to your blog for sometime now and it is certainly one that I HIGHLY recommend. I have learnt so much from you already. I so appreciate your taking the time to share your ideas, creativity and your amazing talent with us. Thank you! I look forward to every update and quickly scoot over to see whats new. I subscibe and love seeing your work. I'm always amazed by your wonderful coloring of stamped images and fun ways to use ribbon on your cards. Thanks!